The Miami Dolphins should win these games, right? Difference is this year they ARE winning these games. The Dolphins went into a crazed Meadowland that was intoxicated with it’s new star rookie QB and abruptly cancelled the party. After the Jets blew out the Lions in their season opener there was great hype surrounding the 2018 version of the New York Jets. Would the highly drafter Sam Darnold be the QB savior they have been waiting for? The answer is, maybe. Look in all fairness to Darnold, he played pretty solid considering he was under pressure and was seeing a lot of zone coverages that, as a rookie, he isn’t use to seeing. This was a learning game for him. Give Matt Burke and the defensive line credit. Because they were able to pressure Darnold early on with a four man rush, it allowed the rest of the defense to disguise various coverage packages and flat out confuse the young QB. The result was three sacks and two interceptions on the day. There is a future for Sam Darnold and it looks good. But the rest of the team will have to get better around him and this first round belongs to Miami. 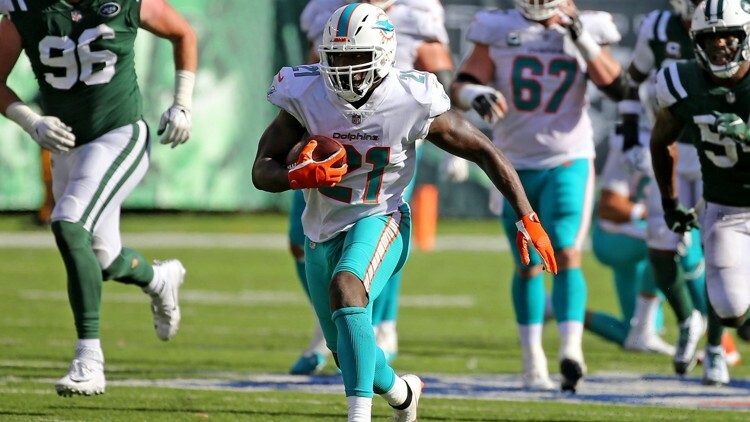 On the offensive side of the ball for the Miami Dolphins, the story was mixed. Ryan Tannehill at times did not look like a seven year veteran as he held the ball WAY too long and took sacks, and on one play he literally just dropped the ball for a fumble and the Jets recovered. He also struggled with his accuracy and missed wide open receivers. None more cringeworthy than when he overthrew a wide open Albert Wilson streaking down the sideline with what could have easily been a big play dagger in the Jets hearts. Now Ryan Tannehill did do some good things. Most notably the big plays he made with his legs. At key moments Ryan was smart to hold on to the ball on the RPO and then use his athleticism to turn in big plays. The running game was also sporadic. At times Kenyan Drake and Frank Gore were able to find a crease and get six to ten yards, but many times there was just nowhere to go. The loss of Pro Bowl Guard Josh Sitton was apparent as the holes that were there in week one were not in week two. So what do we as fans take from this game? Hey, we are 2-0 baby. You can only play your schedule and the Dolphins have won their first two games. The next three games do get harder as they face the Raiders at Hard Rock and then that is followed by the Patriots on the road, and the Bengals on the road. Really tough games. But there are some good things happening that we didn’t see last year. We are winning our winnable games. The team also cleaned up its penalty issues this week and very importantly they showed the ability to close the game out by grinding out the clock on a long drive at the end of the game to seal the victory. Now that is different, and that is movement in the right direction. TALK ABOUT IT IN THE PHINZONE FORUMS! Miami Dolphins Join RISE TO VOTE This Sunday!